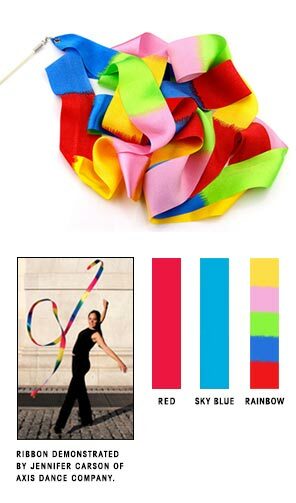 Ribbons have been used by Chinese acrobats, rhymthic gymnasts, and jugglers. A 16-foot length of brightly colored fabric is attached to a fiberglass control stick. The flowing natural movements are quite easy to learn – flicks, circles, snakes, spirals, and throws create a beautiful, graceful effect. Available in three colors. Scotty the Blue Bunny learns how to spin flags and falls in love with our ribbons. See more of Scotty the Blue Bunny on his site.